It’s July, and, like clockwork, brain-eating amoebas are back in the news. Last week, the deadly parasite Naegleria fowleri, which thrives in warm bodies of fresh water, claimed the life of a 21-year-old woman from Inyo County, California. Now a child in Minnesota is believed to have developed primary amebic meningoencephalitis (PAM), the rare, usually fatal form of meningitis caused by N. fowleri. Minnesota state health officials reported Tuesday night that they were investigating a suspected case of PAM in a critically ill child; Wednesday, the University of Minnesota Medical Center reportedly confirmed that it is treating 14-year-old Hunter Boutain for the parasitic illness. Boutain’s prospects are poor; of the 133 instance of N. fowleri infection recorded between 1962 and 2014, all but three have been fatal. State health officials say he developed the condition shortly after swimming at Pope County’s Lake Minnewaska, a popular summertime destination for beach-goers in west-central Minnesota. That these infections are occurring now is not surprising. Incidences of PAM are rare, but the infection usually strikes in July or August, when water temperatures warm in unison with the summer weather, allowing N. fowleri populations to thrive. Above, a graph of PAM cases reported between 1962 and 2014, charted by month of onset, illustrates this pattern with striking clarity. Now here’s what is surprising about this case: its location. Historically, N. fowleri infections in the U.S. have almost always occurred in sultry southern states. But lately the parasite has been prone to wandering. Minnesota’s first incidence of PAM was documented in 2010, when a seven-year-old girl developed a fatal N. fowleri infection after swimming in Lily Lake, a 36-acre body of water in the city of Stillwater. A second fatal case, this time in a nine-year-old boy, was traced to Lily Lake again in 2012. Prior to the 2010 case, the illness had never been detected north of Missouri, hundreds of miles south. It is not yet clear whether instances of N. fowleri infection are increasing; according to epidemiologist Jonathan Yoder, who tracks N. fowleri for the Centers for Disease Control’s division of parasitic diseases, data on the parasite do not indicate infections are becoming more common. They do, however, suggest the amoeba is moving farther north, and that, as the planet warms, N. fowleri could continue to expand its geographic range. All that being said, cases of N. fowleri infection remain quite rare, especially when you consider the abundance of the amoeba itself. Yoder and his colleagues have described the brain-eating parasite as “ubiquitous”; it is impossible to know exactly how many people swim in lakes inhabited by N. fowleri every year, but several million would be a reasonable estimate. And yet, very few people are diagnosed with PAM: between zero and eight per year, in the U.S. This disparity between exposure and infection probably speaks to the circuitous route the amoeba must take to access the brain. The amoeba makes its way to one’s gray matter via the olfactory nerves, which it accesses when water is forced up the nose. Doctors think Annie Bahneman, the seven-year-old infected at Lily Lake in 2010, was exposed to the parasite while practicing handstands in the water. On one hand, this makes avoiding infection pretty simple: If you find yourself in a warm body of fresh water, don’t submerge your head, and, if you do, hold your nose or wear a nose clip. On the other, these measures are just as easily ignored, especially by kids, who are far and away the most common victims of N. fowleri infections in the U.S. Contact the author at rtgonzalez@io9.com and @rtg0nzalez. 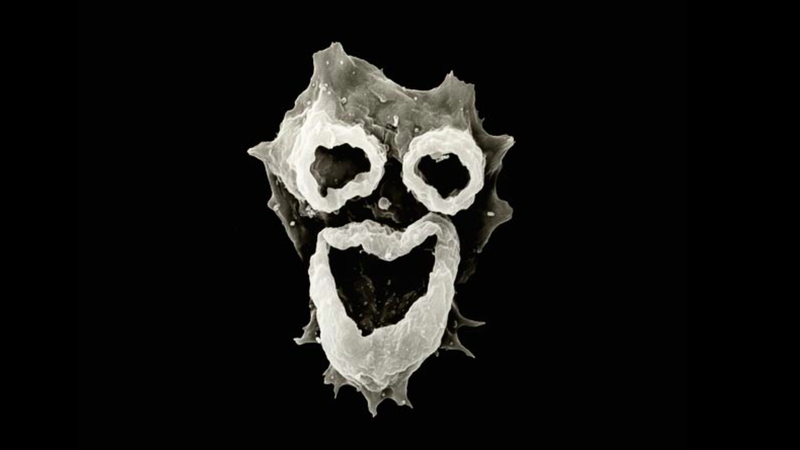 Top Photo: A microscopic view of Naegleria fowleri reveals a trio of feeding structures, twisted into a macabre clown-face. Image by D.T. John & T.B. Cole, Visuals Unlimited, via NatGeo.